The market was only able to break the triangle’s lower border, and then the correction started. Most likely it won’t be long, and the descending movement, which is forming wave  of 3, will resume. 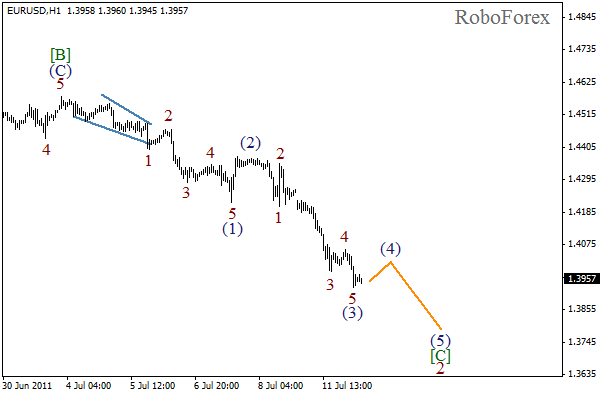 Quick impulse in wave (1) was replaced by a slow correction in wave (2) in the form of flat pattern. 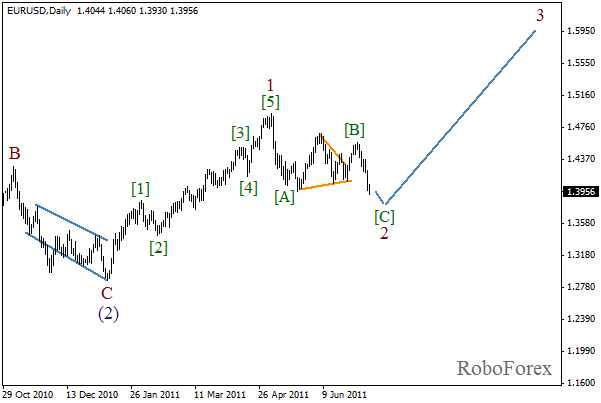 On the minor wave level we can see the formation of wave C. The forecast is still bearish. 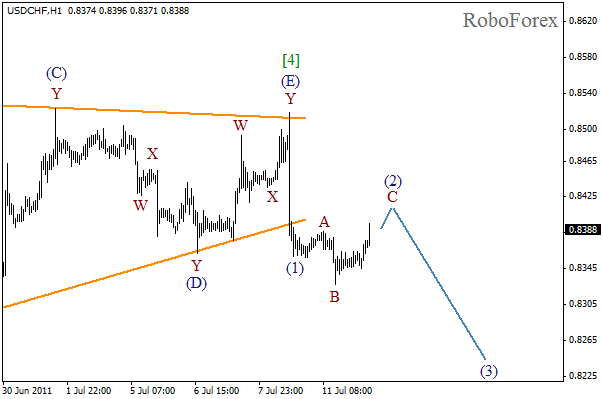 Yesterday the price broke the minimum, which makes us to take a closer look to wave markings. 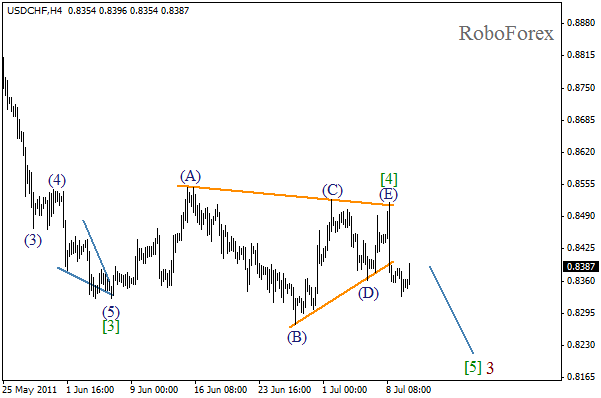 It looks like wave 2 is being formed in the form of zigzag pattern. The most difficult part of this wave is wave [B]. Currently we can see the formation of wave [C], but I don’t think that its range will be more than the one of wave [A]. During the next several days we should expect the end of the correction and the continuation of bullish trend. 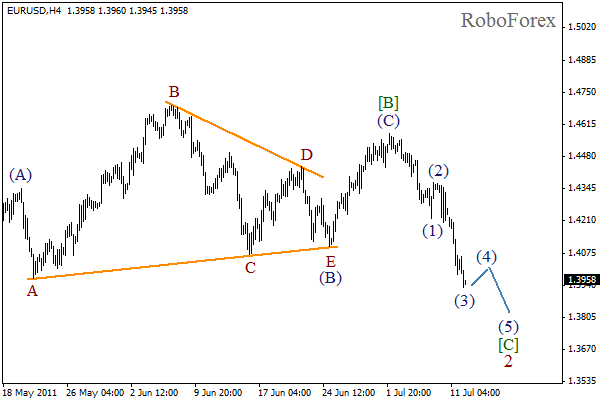 At the H4 chart we can see that wave [B] includes a horizontal triangle inside wave (B). We also can see the formation of wave [C] with the third wave inside it. Local correction may take place, and after it is finished, we should expect the start of wave (5). More detailed marking is shown on the H1 chart. Internal structure of wave (3) let us suppose that this wave may be finished. The forecast of price movement is shown on the chart. The formation of wave [C] may continue during the day, but soon it will be finished.